The kidneys are bean-shaped urinary system and also serve homeostatic functions such as the regulation of electrolytes, maintenance of acid–base balance, and regulation of blood pressure (via maintaining salt and water balance). They serve the body as a natural filter of the blood, and remove water soluble wastes, which are diverted to the urinary bladder. In producing urine, the kidneys excrete wastes such as urea and ammonium, and they are also responsible for the reabsorption of water, glucose, and amino acids. The kidneys also produce hormones including calcitriol, erythropoietin, and the enzyme renin, the last of which indirectly acts on the kidney in negative feedback. Renal physiology is the study of kidney function, while nephrology is the medical specialty concerned with kidney diseases. Diseases of the kidney are diverse, but individuals with kidney disease frequently display characteristic clinical features. Common clinical conditions involving the kidney include the nephritic and nephrotic syndromes, renal cysts, acute kidney injury, chronic kidney disease, urinary tract infection, nephrolithiasis, and urinary tract obstruction. Various cancers of the kidney exist; the most common adult renal cancer is renal cell carcinoma. Cancers, cysts, and some other renal conditions can be managed with removal of the kidney, or nephrectomy. When renal function, measured by glomerular filtration rate, is persistently poor, dialysis and kidney transplantation may be treatment options. Although they are not normally harmful, kidney stones can be painful, and repeated, chronic formation of stones can scar the kidneys. The removal of kidney stones involves ultrasound treatment to break up the stones into smaller pieces, which are then passed through the urinary tract. One common symptom of kidney stones is a sharp to disabling pain in the medial/lateral segments of the lower back or groin. Surface projections of the organs of the trunk, showing kidneys at the level of T12 to L2. In humans the kidneys are located in the abdominal cavity, more specifically in the paravertebral gutter and lie in a retroperitoneal position at a slightly oblique angle. There are two kidneys. One is on each side of the spine. The asymmetry within the abdominal cavity caused by the liver typically results in the right kidney being slightly lower than the left, and left kidney being located slightly more medial than the right. The left kidney is approximately at the vertebral level T12 to L3, and the right slightly lower. The right kidney sits just below the diaphragm and posterior to the liver, the left below the diaphragm and posterior to the spleen. Resting on top of each kidney is an adrenal gland. The upper (cranial) parts of the kidneys are partially protected by the eleventh and twelfth ribs, and each whole kidney and adrenal gland are surrounded by two layers of fat (the perirenal and pararenal fat) and the renal fascia. Each adult kidney weighs between 125 and 170 grams in males and between 115 and 155 grams in females. The left kidney is usually slightly larger than the right kidney. The kidney has a renal vein and ureter leave. The kidney is surrounded by tough fibrous tissue, the renal capsule, which is itself surrounded by perinephric fat, renal fascia (of Gerota) and paranephric fat. The anterior (front) border of these tissues is the peritoneum, while the posterior (rear) border is the transversalis fascia. The superior border of the right kidney is adjacent to the liver; and the spleen, for the left kidney. Therefore, both move down on inhalation. The kidney is approximately 11–14 cm (4.3–5.5 in) in length, 6 cm (2.4 in) wide and 4 cm (1.6 in) thick. The substance, or parenchyma, of the kidney is divided into two major structures: superficial is the renal cortex and deep is the renal medulla. Grossly, these structures take the shape of 8 to 18 cone-shaped renal lobes, each containing renal cortex surrounding a portion of medulla called a renal pyramid (of Malpighi). Between the renal pyramids are projections of cortex called renal columns (of Bertin). Nephrons, the urine-producing functional structures of the kidney, span the cortex and medulla. The initial filtering portion of a nephron is the renal corpuscle, located in the cortex, which is followed by a renal tubule that passes from the cortex deep into the medullary pyramids. Part of the renal cortex, a medullary ray is a collection of renal tubules that drain into a single collecting duct. The tip, or papilla, of each pyramid empties urine into a minor calyx; minor calyces empty into major calyces, and major calyces empty into the renal pelvis, which becomes the ureter. At the hilum, the ureter and renal vein exit the kidney while the renal artery enters. Surrounding these structures is hilar fat and lymphatic tissue with lymph nodes. The hilar fat is contiguous with a fat-filled cavity called the renal sinus. The renal sinus collectively contains the renal pelvis and calyces and separates these structures from the renal medullary tissue. 3D-rendered computed tomography, showing renal arteries and veins. The kidneys receive blood from the renal arteries, left and right, which branch directly from the abdominal aorta. Despite their relatively small size, the kidneys receive approximately 20% of the cardiac output. Each renal artery branches into segmental arteries, dividing further into interlobar arteries, which penetrate the renal capsule and extend through the renal columns between the renal pyramids. The interlobar arteries then supply blood to the arcuate arteries that run through the boundary of the cortex and the medulla. Each arcuate artery supplies several interlobular arteries that feed into the afferent arterioles that supply the glomeruli. The medullary interstitium is the functional space in the kidney beneath the individual filters (glomeruli), which are rich in blood vessels. The interstitium absorbs fluid recovered from urine. Various conditions can lead to scarring and congestion of this area, which can cause kidney dysfunction and failure. After filtration occurs the blood moves through a small network of venules that converge into interlobular veins. As with the arteriole distribution the veins follow the same pattern, the interlobular provide blood to the arcuate veins then back to the interlobar veins, which come to form the renal vein exiting the kidney for transfusion for blood. The renal artery enters into the kidney at the level of first lumbar vertebra just below the superior mesenteric artery. As it enters the kidney it divides into branches: first the segmental artery, which divides into 2 or 3 lobar arteries, then further divides into interlobar arteries, which further divide into the arcuate artery, which leads into the interlobular artery, which form afferent arterioles. The afferent arterioles form the glomerulus (network of capillaries closed in Bowman's capsule). From here, efferent arterioles leaves the glomerulus and divide into peritubular capillaries, which drain into the interlobular veins and then into arcuate vein and then into interlobar vein, which runs into lobar vein, which opens into the segmental vein and which drains into the renal vein, and then from it blood moves into the inferior vena cava. The kidney and nervous system communicate via the renal plexus, whose fibers course along the renal arteries to reach each kidney. Input from the sympathetic nervous system triggers vasoconstriction in the kidney, thereby reducing renal blood flow. The kidney also receives input from the parasympathetic nervous system, by way of the renal branches of the vagus nerve (cranial nerve X); the function of this is yet unclear. Sensory input from the kidney travels to the T10-11 levels of the spinal cord and is sensed in the corresponding dermatome. Thus, pain in the flank region may be referred from corresponding kidney. The mammalian kidney develops from intermediate mesoderm. Kidney development, also called nephrogenesis, proceeds through a series of three successive phases, each marked by the development of a more advanced pair of kidneys: the pronephros, mesonephros, and metanephros. The kidney participates in whole-body endocrine system. Various endocrine hormones coordinate these endocrine functions; these include renin, angiotensin II, aldosterone, antidiuretic hormone, and atrial natriuretic peptide, among others. Many of the kidney's functions are accomplished by relatively simple mechanisms of filtration, reabsorption, and secretion, which take place in the nephron. Filtration, which takes place at the renal corpuscle, is the process by which cells and large proteins are filtered from the blood to make an ultrafiltrate that eventually becomes urine. The kidney generates 180 liters of filtrate a day, while reabsorbing a large percentage, allowing for the generation of only approximately 2 liters of urine. Reabsorption is the transport of molecules from this ultrafiltrate and into the blood. Secretion is the reverse process, in which molecules are transported in the opposite direction, from the blood into the urine. The kidneys excrete a variety of waste products produced by metabolism into the urine. These include the nitrogenous wastes urea, from protein catabolism, and uric acid, from nucleic acid metabolism. The ability of mammals and some birds to concentrate wastes into a volume of urine much smaller than the volume of blood from which the wastes were extracted is dependent on an elaborate countercurrent multiplication mechanism. This requires several independent nephron characteristics to operate: a tight hairpin configuration of the tubules, water and ion permeability in the descending limb of the loop, water impermeability in the ascending loop, and active ion transport out of most of the ascending limb. In addition, passive countercurrent exchange by the vessels carrying the blood supply to the nephron is essential for enabling this function. Glucose at normal plasma levels is completely reabsorbed in the proximal tubule. The mechanism for this is the Na+/glucose cotransporter. A plasma level of 350 mg/dL will fully saturate the transporters and glucose will be lost in the urine. A plasma glucose level of approximately 160 is sufficient to allow glucosuria, which is an important clinical clue to diabetes mellitus. Amino acids are reabsorbed by sodium dependent transporters in the proximal tubule. Hartnup's disease is a deficiency of the tryptophan amino acid transporter, which results in pellagra. AT II stimulates Na+, H2O and HCO3− reabsorption. Reabsorbs via medullary hypertonicity and makes urine hypertonic. This region is impermeable to H2O and the urine becomes less concentrated as it ascends. Na+ is reabsorbed in exchange for K+, and H+, which is regulated by aldosterone. Pregnancy reduces the reabsorption of glucose and amino acids. Two organ systems, the kidneys and lungs, maintain acid-base homeostasis, which is the maintenance of pH around a relatively stable value. The lungs contribute to acid-base homeostasis by regulating carbon dioxide (CO2) concentration. The kidneys have two very important roles in maintaining the acid-base balance: to reabsorb and regenerate bicarbonate from urine, and to excrete hydrogen ions and fixed acids (anions of acids) into urine. Any significant rise in plasma osmolality is detected by the hypothalamus, which communicates directly with the posterior pituitary gland. An increase in osmolality causes the gland to secrete antidiuretic hormone (ADH), resulting in water reabsorption by the kidney and an increase in urine concentration. The two factors work together to return the plasma osmolality to its normal levels. ADH binds to principal cells in the collecting duct that translocate aquaporins to the membrane, allowing water to leave the normally impermeable membrane and be reabsorbed into the body by the vasa recta, thus increasing the plasma volume of the body. Urea is usually excreted as a waste product from the kidneys. However, when plasma blood volume is low and ADH is released the aquaporins that are opened are also permeable to urea. This allows urea to leave the collecting duct into the medulla creating a hyperosmotic solution that 'attracts' water. Urea can then re-enter the nephron and be excreted or recycled again depending on whether ADH is still present or not. The 'Single effect' describes the fact that the ascending thick limb of the loop of Henle is not permeable to water but is permeable to NaCl. This allows for a countercurrent exchange system whereby the medulla becomes increasingly concentrated, but at the same time setting up an osmotic gradient for water to follow should the aquaporins of the collecting duct be opened by ADH. Although the kidney cannot directly sense blood, long-term regulation of blood pressure predominantly depends upon the kidney. This primarily occurs through maintenance of the extracellular fluid compartment, the size of which depends on the plasma sodium concentration. Renin is the first in a series of important chemical messengers that make up the renin-angiotensin system. Changes in renin ultimately alter the output of this system, principally the hormones angiotensin II and aldosterone. Each hormone acts via multiple mechanisms, but both increase the kidney's absorption of sodium chloride, thereby expanding the extracellular fluid compartment and raising blood pressure. When renin levels are elevated, the concentrations of angiotensin II and aldosterone increase, leading to increased sodium chloride reabsorption, expansion of the extracellular fluid compartment, and an increase in blood pressure. Conversely, when renin levels are low, angiotensin II and aldosterone levels decrease, contracting the extracellular fluid compartment, and decreasing blood pressure. The kidneys secrete a variety of hormones, including erythropoietin, and the enzyme renin. Erythropoietin is released in response to hypoxia (low levels of oxygen at tissue level) in the renal circulation. It stimulates erythropoiesis (production of red blood cells) in the bone marrow. Calcitriol, the activated form of vitamin D, promotes intestinal absorption of calcium and the renal reabsorption of phosphate. Part of the renin-angiotensin-aldosterone system, renin is an enzyme involved in the regulation of aldosterone levels. Calculations of kidney performance are an important part of physiology and can be estimated using the calculations below. Normal human FF is 20%. Renal clearance is the volume of plasma from which the substance is completely cleared from the blood per unit time. Cx is the clearance of X (normally in units of mL/min. Ux is the urine concentration of X.
Px is the plasma concentration of X.
V is the urine flow rate. Duplex kidneys, or double kidneys, occur in approximately 1% of the population. This occurrence normally causes no complications, but can occasionally cause urine infections. Autosomal recessive polycystic kidney disease is far less common, but more severe, than the dominant condition. It is apparent in utero or at birth. Renal agenesis. Failure of one kidney to form occurs in approximately one in 750 live births. Failure of both kidneys to form is invariably fatal. 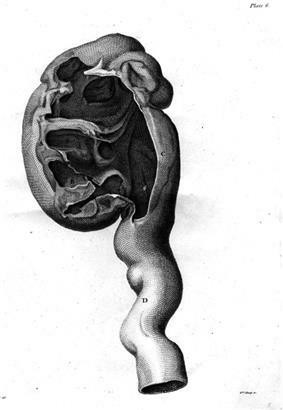 Drawing of an enlarged kidney by John Hunter. 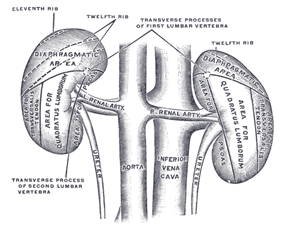 Hydronephrosis is the enlargement of one or both of the kidneys caused by obstruction of the flow of urine. Kidney stones (nephrolithiasis) are a relatively common and particularly painful disorder. In nephrotic syndrome, the glomerulus has been damaged so that a large amount of protein in the blood enters the urine. Other frequent features of the nephrotic syndrome include swelling, low serum albumin, and high cholesterol. Pyelonephritis is infection of the kidneys and is frequently caused by complication of a urinary tract infection. Generally, humans can live normally with just one kidney, as one has more functioning renal tissue than is needed to survive. Only when the amount of functioning kidney tissue is greatly diminished does one develop chronic kidney disease. Renal replacement therapy, in the form of dialysis or kidney transplantation, is indicated when the glomerular filtration rate has fallen very low or if the renal dysfunction leads to severe symptoms. Many renal diseases are diagnosed on the basis of classical clinical findings. A physician (usually a nephrologist) begins by taking a detailed clinical history and performs a physical examination. In addition to medical history and presenting symptoms, a physician will ask about medication history, family history recent infections, toxic/chemical exposures and other historical factors that may indicate an etiology for the patient's renal disease. Often, some diseases are suggested by clinical history and time course alone. For example, in a formerly healthy child with a recent upper respiratory tract infection and facial/lower limb swelling, findings of proteinuria on urinalysis, a diagnosis of minimal change disease is highly suggested. Similarly, a patient with a history of diabetes who presents with decreased urine output is most likely to be suffering from diabetic nephropathy. Often, such cases do not require extensive workup (such as with renal biopsy). A presumptive diagnosis can be made on the basis of history, physical exam and supportive laboratory studies. Laboratory studies are an important adjunct to clinical evaluation for assessment of renal function. An initial workup of a patient may include a complete blood count (CBC); serum electrolytes including sodium, potassium, chloride, bicarbonate, calcium, and phosphorus; blood urea, nitrogen and creatinine; blood glucose and glycocylated hemoglobin. Glomerular filtration rate (GFR) can be calculated. Urine studies may include urine electrolytes, creatinine, protein, fractional excretion of sodium (FENA) and other studies to assist in evaluation of the etiology of a patient's renal disease. Urinalysis is used to evaluate urine for its pH, protein, glucose, specific gravity and the presence of blood/hemoglobin. Microscopic analysis can be helpful in the identification of casts, red blood cells, white blood cells and crystals. Imaging studies are important in the evaluation of structural renal disease caused by urinary tract obstruction, renal stones, renal cyst, mass lesions, renal vascular disease, and vesicoureteral reflux. Imaging techniques used most frequently include renal ultrasound and helical CT scan. Patients with suspected vesicoureteral reflux may undergo voiding cystourethrogram (VCUG). The role of the renal biopsy is to diagnose renal disease in which the etiology is not clear based upon noninvasive means (clinical history, past medical history, medication history, physical exam, laboratory studies, imaging studies). A detailed description of renal biopsy interpretation is beyond the scope of this article. In general, a renal pathologist will perform a detailed morphological evaluation and integrate the morphologic findings with the clinical history and laboratory data, ultimately arriving at a pathological diagnosis. A renal pathologist is a physician who has undergone general training in anatomic pathology and additional specially training in the interpretation of renal biopsy specimens. Ideally, multiple core sections are obtained and evaluated for adequacy (presence of glomeruli) intraoperatively. A pathologist/pathology assistant divides the specimen(s) for submission for light microscopy, immunofluorescence microscopy and electron microscopy. The pathologist will examine the specimen using light microscopy with multiple staining techniques (hematoxylin and eosin/H&E, PAS, trichrome, silver stain) on multiple level sections. Multiple immunofluorescence stains are performed to evaluate for antibody, protein and complement deposition. Finally, ultra-structural examination is performed with electron microscopy and may reveal the presence of electron-dense deposits or other characteristic abnormalities that may suggest an etiology for the patient's renal disease. Medical terms related to the kidneys commonly use terms such as renal and the prefix nephro-. The adjective renal, meaning related to the kidney, is from the Latin rēnēs, meaning kidneys; the prefix nephro- is from the Ancient Greek word for kidney, nephros (νεφρός). For example, surgical removal of the kidney is a nephrectomy, while a reduction in kidney function is called renal dysfunction. In the majority of vertebrates, the homologous with the vas deferens of amniotes. However, the situation is not always so simple; in cartilaginous fish and some amphibians, there is also a shorter duct, similar to the amniote ureter, which drains the posterior (metanephric) parts of the kidney, and joins with the archinephric duct at the bladder or cloaca. Indeed, in many cartilaginous fish, the anterior portion of the kidney may degenerate or cease to function altogether in the adult. In the most primitive vertebrates, the Amphioxus, these are never homologous with the kidneys of vertebrates, and are more accurately referred to by other names, such as nephridia. In amphibians, kidneys and the urinary bladder harbour specialized parasites, monogeneans of the family Polystomatidae. The kidneys of reptiles consist of a number of lobules arranged in a broadly linear pattern. Each lobule contains a single branch of the ureter in its centre, into which the collecting ducts empty. Reptiles have relatively few nephrons compared with other amniotes of a similar size, possibly because of their lower metabolic rate. Birds have relatively large, elongated kidneys, each of which is divided into three or more distinct lobes. The lobes consists of several small, irregularly arranged, lobules, each centred on a branch of the ureter. Birds have small glomeruli, but about twice as many nephrons as similarly sized mammals. The human kidney is fairly typical of that of mammals. Distinctive features of the mammalian kidney, in comparison with that of other vertebrates, include the presence of the renal pelvis and renal pyramids, and of a clearly distinguishable cortex and medulla. The latter feature is due to the presence of elongated loops of Henle; these are much shorter in birds, and not truly present in other vertebrates (although the nephron often has a short intermediate segment between the convoluted tubules). It is only in mammals that the kidney takes on its classical "kidney" shape, although there are some exceptions, such as the multilobed reniculate kidneys of cetaceans. Kidneys of various animals show evidence of evolutionary adaptation and have long been studied in ecophysiology and comparative physiology. Kidney morphology, often indexed as the relative medullary thickness, is associated with habitat aridity among species of mammals. 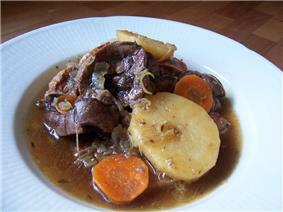 The kidneys can be cooked and eaten (along with other offal). Kidneys are usually grilled or sautéed, but in more complex dishes they are stewed with a sauce that will improve their flavor. In many preparations, kidneys are combined with pieces of meat or liver, as in mixed grill or meurav Yerushalmi. Dishes include the British steak and kidney pie, the Swedish hökarpanna (pork and kidney stew), the French rognons de veau sauce moutarde (veal kidneys in mustard sauce) and the Spanish riñones al Jerez (kidneys stewed in sherry sauce) . The Latin term renes is related to the English word "reins", a synonym for the kidneys in Shakespearean English (e.g. Merry Wives of Windsor 3.5), which was also the time when the King James Version of the Bible was translated. Kidneys were once popularly regarded as the seat of the conscience and reflection, and a number of verses in the Bible (e.g. Ps. 7:9, Rev. 2:23) state that God searches out and inspects the kidneys, or "reins", of humans, together with the heart. Similarly, the Talmud (Berakhoth 61.a) states that one of the two kidneys counsels what is good, and the other evil. According to studies in modern and ancient Hebrew, various body organs in humans and animals served also an emotional or logical role, today mostly attributed to the brain and the endocrine system. The kidney is mentioned in several biblical verses in conjunction with the heart, much as the bowels were understood to be the "seat" of emotion - grief, joy and pain. In the sacrifices offered at the biblical Tabernacle and later on at the temple in Jerusalem, the priests were instructed  to remove the kidneys and the adrenal gland covering the kidneys of the sheep, goat and cattle offerings, and to burn them on the altar, as the holy part of the "offering for God" never to be eaten. In ancient India, according to the Ayurvedic medical systems, the kidneys were considered the beginning of the excursion channels system, the 'head' of the Mutra Srotas, receiving from all other systems, and therefore important in determining a person's health balance and temperament by the balance and mixture of the three 'Dosha's - the three health elements: Vatha (or Vata) - air, Pitta - bile, and Kapha - mucus. The temperament and health of a person can then be seen in the resulting color of the urine. Modern Ayurveda practitioners, a practice which is characterized as pseudoscience, have attempted to revive these methods in medical procedures as part of Ayurveda Urine therapy. These procedures have been called "nonsensical" by skeptics. In ancient Egypt, the kidneys, like the heart, were left inside the mummified bodies, unlike other organs which were removed. Comparing this to the biblical statements, and to drawings of human body with the heart and two kidneys portraying a set of scales for weighing justice, it seems that the Egyptian beliefs had also connected the kidneys with judgement and perhaps with moral decisions. ^ Cotran, RS S.; Kumar, Vinay; Fausto, Nelson; Robbins, Stanley L.; Abbas, Abul K. (2005). Robbins and Cotran pathologic basis of disease. St. Louis, MO: Elsevier Saunders. ^ "HowStuffWorks How Your Kidney Works". ^ "Kidneys Location Stock Illustration". ^ a b c Walter F., PhD. Boron (2004). Medical Physiology: A Cellular And Molecular Approach. Elsevier/Saunders. ^ Glodny B, Unterholzner V, Taferner B, et al. (2009). "Normal kidney size and its influencing factors - a 64-slice MDCT study of 1.040 asymptomatic patients". BMC Urology 9: 19. ^ Clapp, WL. "Renal Anatomy". In: Zhou XJ, Laszik Z, Nadasdy T, D'Agati VD, Silva FG, eds. Silva's Diagnostic Renal Pathology. New York: Cambridge University Press; 2009. ^ a b c d e Bard, Johnathan; Vize, Peter D.; Woolf, Adrian S. (2003). The kidney: from normal development to congenital disease. Boston: Academic Press. p. 154. ^ Schrier, Robert W.; Berl, Tomas; Harbottle, Judith A. (1972). "Mechanism of the Antidiuretic Effect Associated with Interruption of Parasympathetic Pathways". Journal Clinical Investigation 51 (10): 2613–20. ^ Bruce M. Carlson (2004). Human Embryology and Developmental Biology (3rd ed.). Saint Louis: Mosby. ^ a b Le, Tao. First Aid for the USMLE Step 1 2013. New York: McGraw-Hill Medical, 2013. Print. ^ Sample, Ian (2008-02-19). "How many people have four kidneys?". The Guardian (London). ^ "Girl's Kidneys Fail, But Doctors Find Double Valves, Saving Her Life". Abcnews.go.com. 2010-05-18. Retrieved 2011-01-03. ^ Stephen Jones, J.; Inderbir S. Gill; Raymond Rackley (2006). Operative Urology at the Cleveland Clinic. Andrew C. Novick, Inderbir S. Gill, Eric A. Klein, Jonathan H. Ross (eds.). Totowa, NJ: Humana Press. ^ Maton, Anthea; Jean Hopkins; Charles William McLaughlin; Susan Johnson; Maryanna Quon Warner; David LaHart; Jill D. Wright (1993). Human Biology and Health. Englewood Cliffs, New Jersey, USA: Prentice Hall. ^ a b c d e Romer, Alfred Sherwood; Parsons, Thomas S. (1977). The Vertebrate Body. Philadelphia, PA: Holt-Saunders International. pp. 367–376. ^ Al-kahtani, M. A.; C. Zuleta, E. Caviedes-Vidal, and T. Garland, Jr. (2004). "Kidney mass and relative medullary thickness of rodents in relation to habitat, body size, and phylogeny". Physiological and Biochemical Zoology 77 (3): 346–365. ^ History of Nephrology 2 p. 235 by International Association for the History of Nephrology Congress, Garabed Eknoyan, Spyros G. Marketos, Natale G. De Santo, 1997; Reprint of American Journal of Nephrology; v. 14, no. 4–6, 1994. ^ Sangu PK, Kumar VM, Shekhar MS, Chagam MK, Goli PP, Tirupati PK (January 2011). "A study on Tailabindu pariksha - An ancient Ayurvedic method of urine examination as a diagnostic and prognostic tool". Ayu 32 (1): 76–81. ^ A Few Thoughts on Ayurvedic Mumbo-Jumbo, Stephen Barrett, M.D, head of the National Council Against Health Fraud NGO and owner of the QuackWatch website. ^ Salem ME, Eknoyan G (1999). "The kidney in ancient Egyptian medicine: where does it stand?". American Journal of Nephrology 19 (2): 140–7.